I don’t know about you, but it takes me at least an hour to wake up in the morning. This means breakfast needs to be something I can do while essentially brain-dead. In case you’re like me, here are some easy FODMAP friendly breakfast ideas. This quick and easy breakfast is ready in under 10 minutes and is packed with protein and delicious goodness. Feel free to be creative with your eggs. Some standard options include: fried, scrambled, sunny side up, or over easy. You can also hard boil them the night before for a stress-free egg that travels. Remember, if you’re in the elimination phase products like milk or cream should be lactose-free. This FODMAP friendly breakfast is full of delicious protein and fats, but you’ll still need some carbs (and fiber) in there. I usually follow-up my bacon and eggs with a medium-sized banana, or a safe portion of blueberries, strawberries, or grapes. Now that gluten-free products are more mainstream, FODMAP friendly cereals and other boxed items are much easier to find. While a product being gluten-free doesn’t automatically make it low FODMAP, it does help narrow down the search for safe products. To find low FODMAP cereals in your area, check online to see what gluten-free cereals your local grocery store has handy. Then check each brand for any added high FODMAP ingredients. Top off your cereal with some lactose-free milk and fresh fruit. Make sure you check the recommended portion size in your Monash app. Remember, Monash recommends picking one type of fruit per sitting (3 hours). 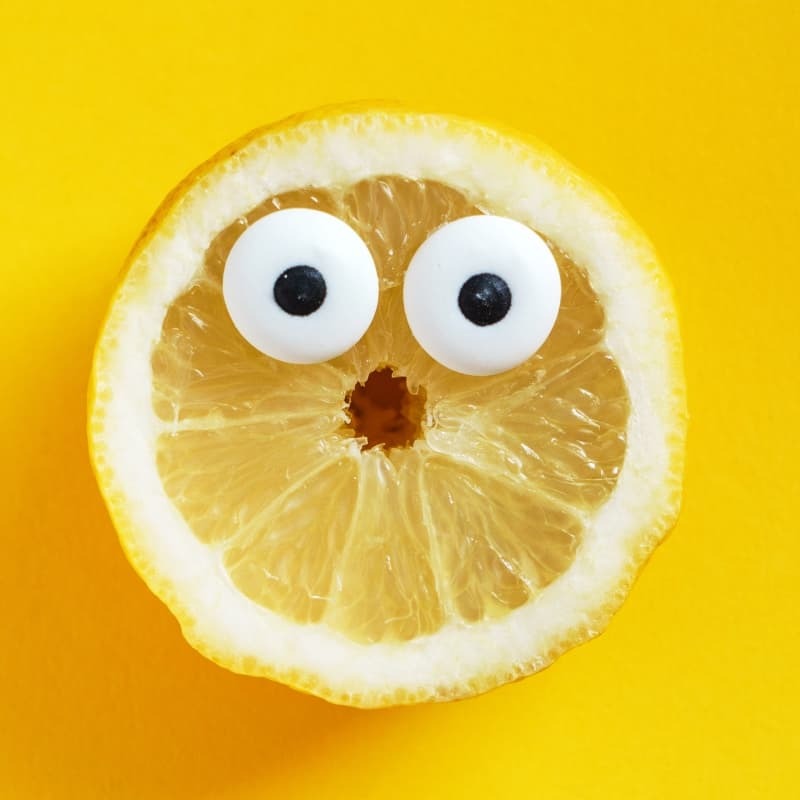 Fruits, in particular, can quickly push you over your FODMAP threshold, so no mixing and matching, I’m afraid. I like PB&J toast as a FODMAP friendly breakfast on the go. Just spread on your peanut butter and jam, then put the slices together for a toasty little sandwich. Don’t forget to wrap the bottom in a paper towel to catch any drips. Be selective when choosing your gluten-free bread, as many gluten-free products contain sneaky FODMAPs like chicory root/inulin, apple, pear, or pineapple juice, as well as other high FODMAP ingredients. My favourite low FODMAP bread is a long-rise sourdough. Even though this bread is made from wheat, it’s still low FODMAP. This is because the fructans in the wheat are broken down by bacteria during the fermentation process. A proper long-rise sourdough takes 24-48 hours to rise. Always check the ingredients for yeast. If it’s listed as an ingredient, the baker cheated and not enough fructans were broken down. No PB&J is complete without peanut butter and jam. Peanut butter is safest when it is 100% peanuts, so look for a pure peanut butter. Monash recommends limiting your serving size to two tbsp per sitting. Servings of three tbsp or more are high in fructans and galactooligosaccharides, so don’t go crazy. As for jam, the only flavour currently recommended in the Monash app is strawberry. Monash recommends using 2 tbsp of jam as well. Remember to check for other high FODMAP ingredients before you eat it. If you’re overpowered by the sheer density of oatmeal like I am, you can add a little lactose-free milk to lighten it up. I find adding some extra liquid helps it settle in my tummy. Give it a try, and let me know if it helps you in the comments below. My favourite FODMAP friendly breakfast is a peanut butter chocolate smoothie. After a morning run, I normally have chocolate milk and a banana topped with peanut butter. As a bit of a joke, one morning I dumped the banana and chocolate milk in a blender and gave it a whirl. I was trying to be cheeky and save time, but it tasted absolutely delicious. To make this, you’ll need 1 medium just-ripe banana, 1 cup lactose-free milk, 2 tbsp peanut butter, and 1 tbsp of a FODMAP friendly chocolate syrup. Stick them all in a personal blender, pulse until it’s smooth. 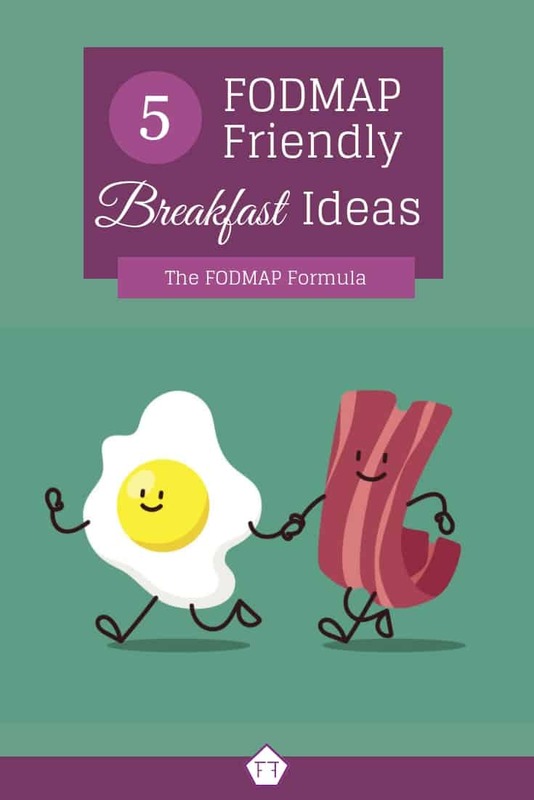 Did you like these FODMAP friendly breakfast ideas? Subscribe to my mailing list below. You’ll get new recipes and articles delivered right to your inbox. You can also follow me on Pinterest for even more breakfast ideas. Together we’ll get the Low FODMAP Diet down to a science! There are lactose-free cheeses available at most major grocery stores. However, most hard cheeses (like cheddar, mozzarella, parmesan, etc.) contain limited lactose as it is broken down by bacteria during the fermentation process. If you want to try dairy products that are high in lactose, you can use Lactaid pills. They release the same enzyme your body normally produces to break down lactose into your digestive tract to break down the lactose molecules. While low FODMAP bread options are limited, I did mention two bread options (Glutino’s Gluten-Free White Sandwich Loaf and buckwheat sourdough bread – normally baked fresh in store). Most major grocery stores list their products online. So, if you’re looking for a low FODMAP bread option, I recommend grabbing your Monash app and looking up local brands to see if any of them work for you. Finally, the Low FODMAP Diet eliminates highly fermentable short-chain carbohydrates only. Since bacon and eggs are both proteins, they do not contain FODMAPs. Some IBS patients have trouble digesting fatty foods like bacon or protein dense foods like eggs, but these are outside the scope of the LFD program. If you find a food doesn’t agree with you, it’s ok to eliminate it even if it isn’t specifically a high FODMAP food. I hope this has answered your questions! This sounds delectable, but when I drink chocolate milk, I almost always wake up in the middle of the night with a horrible stomach ache. Could it be the chocolate syrup? Or the milk?? There are a few things you will need to investigate if chocolate milk is giving you trouble. The first is the milk itself. You could be reacting to either the lactose or the fat content. The easiest way to check is to try making it with a lactose-free milk. If that doesn’t help, you can try lowering the fat content of the milk. Fat can cause your gut to spasm, so lowering the fat content may make it easier on your system. If you’re in the elimination phase of the program, you should be using lactose-free milk anyways. The final thing to consider is the syrup. I always recommend grabbing your Monash app and taking a cruise through your local grocery store’s website. Check for fructose, high fructose corn syrup (HFCS), any polyols (normally ending in -ol), and any other suspect ingredients. The banana also adds a little fiber which will slow down the transit of the sugar. Remember, Monash has updated their recommendation for bananas. Unripe bananas are still low FODMAP, while bananas with spots are high in Fructans. Monash explains more about bananas here. 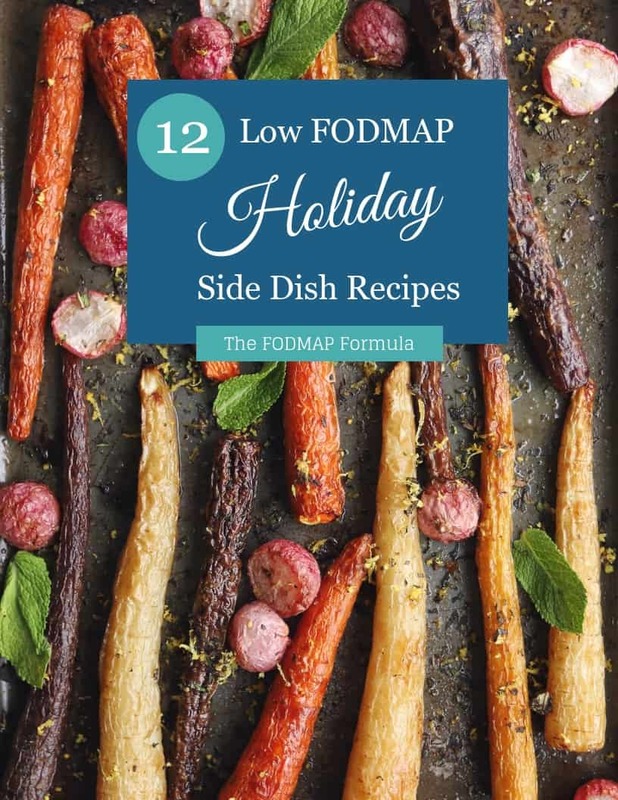 Previous post: What is the Low FODMAP Diet?